MATILDA WORMWOOD is a genius - her brain fizzes and bubbles with brilliance. She outwits her gruesome parents, and even her terrifying head teacher, the monstrous Miss Trunchbull. YOU TOO can baffle, bewilder and bamboozle your friends and family! ASTOUND them with feats of calcu... read full description below. MATILDA WORMWOOD is a genius - her brain fizzes and bubbles with brilliance. She outwits her gruesome parents, and even her terrifying head teacher, the monstrous Miss Trunchbull. YOU TOO can baffle, bewilder and bamboozle your friends and family! ASTOUND them with feats of calculation, scientific miracles, incredible creativity and fiendishly clever tricks, all with simple, step-by-step instructions. 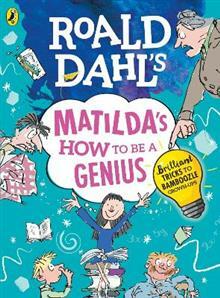 Inspired by ROALD DAHL'S terrific tale MATILDA, this is the perfect book for budding brainboxes everywhere! Roald Dahl (Author) Roald Dahl was a spy, ace fighter pilot, chocolate historian and medical inventor. He was also the author of Charlie and the Chocolate Factory, Matilda, The BFG and many more brilliant stories. He remains the world's number one storyteller Quentin Blake (Illustrator) Quentin Blake has illustrated more than three hundred books and was Roald Dahl's favourite illustrator. In 1980 he won the prestigious Kate Greenaway Medal. In 1999 he became the first ever Children's Laureate and in 2013 he was knighted for services to illustration.